Busy this morning but wanted to share a post from several years back. This concerns a group of four paintings in my early Exiles series which is work that I often find myself turning to in times of anxiety. I show these four paintings together as one piece called Exiles: Quartet. It’s a pretty honest look at how the Exiles series came about and what it meant to me. I hinted several years ago that I might restart the series but it hasn’t come about. Yet. We’ll see– there’s definitely enough anxiety around to fuel their creation. I have written about and showed a number of the pieces from my early Exiles series here on this blog. It was a very important group of work for me in that it was the first real break towards forming my own voice, creating and displaying work that was emotional for myself. It was also the work that spawned my first solo show in early 1997. The inspiration for this work was mainly drawn from the experience of watching my mother suffer and die from lung cancer over a short five or six month period in 1995. Her short and awful struggle was hard to witness, leaving me with a deep sense of helplessness as I could only wish that there was a way in which I could somehow alleviate her pain. Most of the work deals with figures who are in some form of retrospection or prayer, wishing for an end to their own suffering. But another part of this work was drawn from my own feelings of emotional exile, a feeling of estrangement in almost every situation. I had spent the better part of my life to that point as though I didn’t belong anywhere, always on the outside viewing the world around me as a stranger in a strange land, to borrow the words of that most famous biblical exile, Moses. These figures were manifestations of that sense of inner exile that I carried with me. Little did I know that these very figures would help me find a way out of this exile. With their creation came a sense of confidence and trust in the power of my self-revelation. I could now see that the path from the hinterlands of my exile was not in drawing my emotions more and more inward, allowing no one to see. No, the path to a reunion with the world was through pouring this emotion onto the surface of paper or canvas for all to see. This is hard to write and I am struggling with it as I sit here this morning. I started writing this because I had been reconsidering revisiting this series, creating a new generation of Exiles. But in pondering this idea I realized that the biggest obstacle was in the fact that I no longer felt so much a stranger in a strange land. I no longer felt like the Exile, no longer lived every moment with these figures. It turned out that they were guides for me, leading me back to the world to which I now feel somewhat connected, thanks to my work. If there is to be a new series, they will most likely not be Exiles. 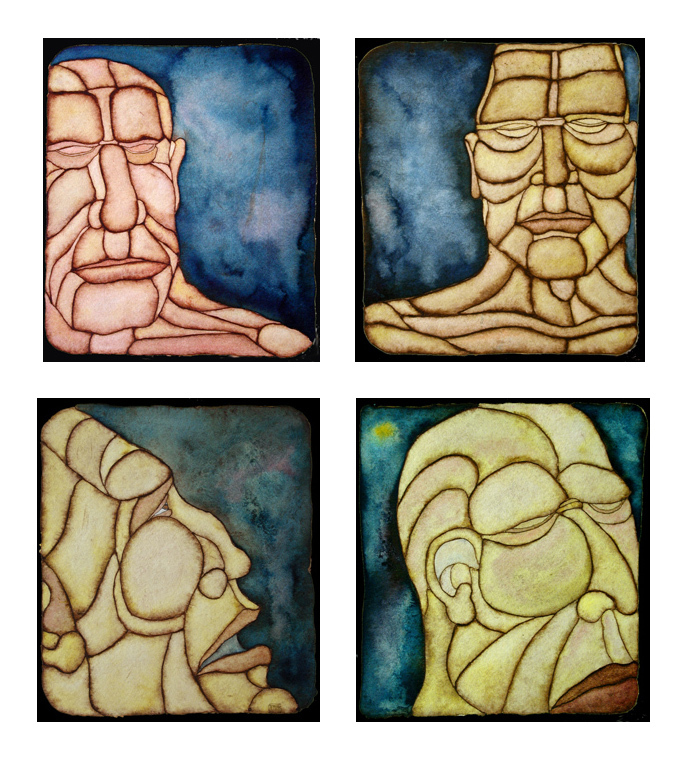 The piece shown here, Quartet, is one of my favorites, a grouping of four figures. You may not see it in these figures but the visual influence for this work were the carvings found on Mayan ruins of Mexico and Central America. I myself see this mainly in the figure at the bottom right. Thank you, Rhonda. And may you be happy, be healthy and live with ease, as well.